Aloe plants are native to Africa but are popular all over the world. Besides their ornamental uses, they are valued for medicinal and culinary uses as well. It is common for aloe plants to grow wide, or “leggy,” as they get older. Because of this, it is important to choose wide pots whenever you need to replant them. Because they are succulents, they also need slightly sandy soil with good drainage. Keeping these things and their dormant period in mind should be all it takes to make your leggy aloe happy in its new pot. Transplant your aloe only when it is actively growing, such as in the spring. Do not attempt to transplant it during its dormant period. If you do so, you will run the risk of shocking your sleeping plant. Squeeze the sides of the pot your aloe is currently in, if it is flexible. If it is not, lightly but firmly run your trowel around the outside, loosening the entire block of soil your aloe is occupying. If you can, dig the trowel underneath the root ball. You want to loosen the soil and the root ball in the pot, but you want to try to avoid nicking or cutting your aloe’s roots. Prepare the wider new pot for your aloe. To do this, fill it with either cactus soil mix or a mixture of potting soil, sand and perlite or vermiculite. If you are creating your own mix, use 50 percent potting soil, 25 percent sand, and 25 percent perlite or vermiculite and mix thoroughly. Leave a hole in the new soil that is about the size of your aloe’s root ball. Slightly deeper is also OK.
Plant the aloe in the hole and completely cover the root ball with soil. Water your aloe and place back in its sunny window. Using your aloe's larger leaves can help to control its natural tendency toward legginess. 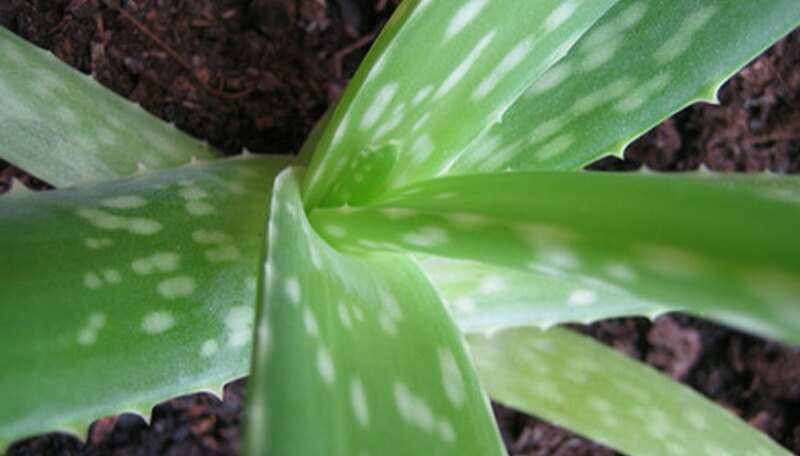 Try picking a larger leaf and squeezing some of the aloe gel on a sunburn next time someone in your family has one. You can also try the gel in smoothies, as it is a natural and healthy breath freshener. Aloe also works nicely as a natural hair-styling gel. Be careful when handling your aloe. Some varieties can have sharp tips to their leaves or other rough or sharp parts along their blades.